and, we are going to discuss more here. 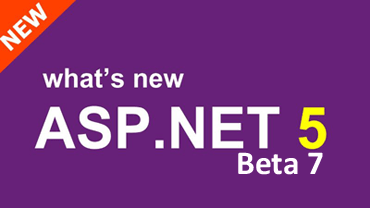 This blog post is the last post of the series of what is new in asp.net 5 beta 7. so, we are going to cover the rest of all things plus newly released WebHooks preview of ASP.NET family. With the release of ASP.NET 5 beta 7, they had added the ability for a TagHelper to be written void element. The default value of CloseAfterOpeningTag will be false with the behaviors of IF there are multiple TagHelper working on a single HTML element. When the user calls TagHelperContext.GetChildContentAsync it was uses cached the result, so in this release of ASP.NET 5 beta 7, they add an overload to reevaluate by passing useCachedResult to false in overload method. Another improvement in MVC is that, consider following Razor syntax with line comment. Routing is just middleware for routing the request to application request. It sits between application request and files which are not present physically in your web application. ASP.NET security contains authentication, authorization and security middleware for ASP.NET only. ASP.NET security removed basic authentication due to its insecure and having performance issues. ASP.NET security has Data Protection API and integrates with most of the project like SignalR. In the previous version of asp.net, there was sluggish Session, which will degrade the performance of your application. Now, ASP.NET 5 support middleware for the session, and for that you just have to set up session database. While developing the modern web application, the programmer often saves oAuth secrets, and due to security risks they do not want to commit that file into source control. It’s more dangerous while working with open source projects using public source control system like Github. The config file that is used in DNX based application that guide developer to not checking those resources to public source control. WebHooks was not part of the initial release of ASP.NET 5 beta 7. Lately, WebHooks preview has been added to ASP.NET 5 family as of its simplicity and its lightweight HTTP based publish/subscribe pattern. When an event happens in service, HTTP based POST notification sent to the register subscribers. Post notification contains the information regarding events and that information is helpful for the receiver to act accordingly. Due to its simplicity many organizers using it as APIs like Dropbox, Paypal, Slack, Instagram, Trello etc.